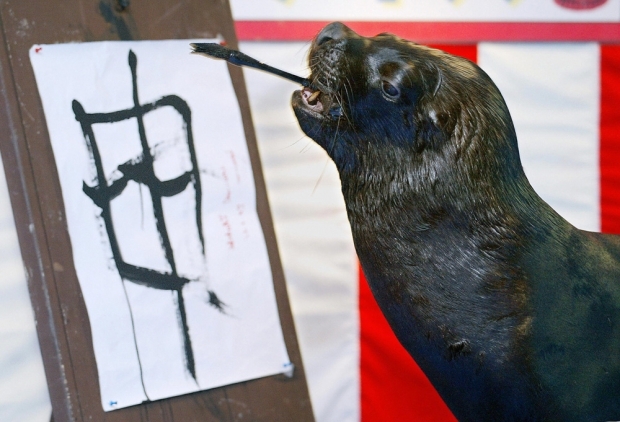 Jonao, a six-year-old male sea lion, holds a writing brush in his mouth to write the Chinese character for “monkey,” connected with the year of the monkey, 2004, at Sea Paradise aquarium in a Tokyo suburb, December 31, 2003. Fast-forward more than a century, and while none of us are running the Chinese government yet, the joys and frustrations of learning the Chinese language are as high and low as they have ever been. Fortunately, we have a new avenue for kvetching in podcast form, which is what Sinica stalwarts Jeremy Goldkorn and David Moser have joined Kaiser to do this week. Also in the studio representing the next generation of Chinese speakers are newcomers Jessica Montesano and Charlie Melvoin, who share their own experiences learning Chinese and talk about what exactly is happening in the States with bilingual education programs.